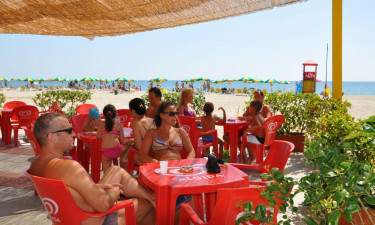 Stay in a luxurious mobile home on Italy's beautiful southern coast. Our holiday camping site offers seaside fun and camping luxury for the whole family. Book with LUX-camp now to reserve your place in the sun. 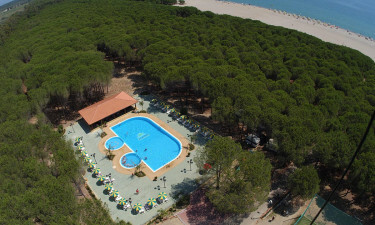 Why choose Thurium for a camping holiday? Why not hire a bicycle and explore the local area? The rocky coast of Calabria offers gorgeous views of the sea and mountains. The pretty town of Corigliano Calabro, with its castle overlooking the river, is nearby, close to the ruins of the ancient city of Sybaris. Further afield, nature lovers can take a day trip to enjoy hiking or rambling in the beautiful national parks of Sila and Pollino. 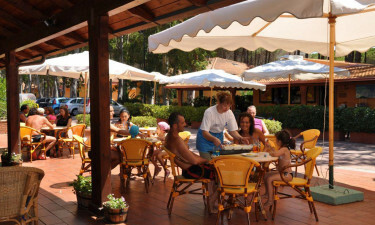 The luxury camping site is right on the Ionian coast, offering swimming, sunbathing and water sports. The sloping, sandy beach is child-friendly, perfect for play and paddling, and there are sun loungers and parasols for your comfort. 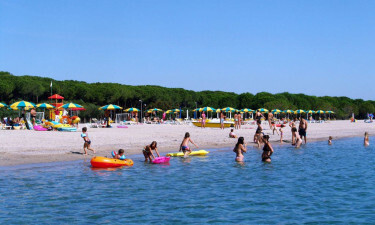 If you're feeling energetic, try a game of beach volleyball or hire a pedalo. During the summer months, you can also enjoy fun and exercise in our large outdoor pool. Get some serious lengths in, or simply float, then unwind with a relaxing session in the Jacuzzi. Children can take part in a packed programme of games and activities from our Mini Club, while adults chill out. The campsite also has a children's playground to keep them busy. 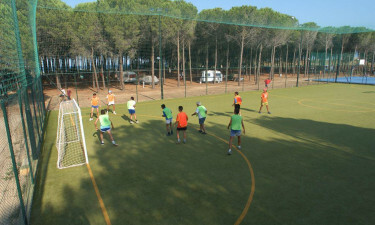 There are plenty of activities for the whole family to enjoy, including table tennis and football. Make new friends with five-a-side matches, play tennis with the family, or have a go at the surprisingly technical sport of bowls. The fun continues into the evening, with entertainment and shows for adults and families. LUX-camp has you covered for your daily needs, as well as the little luxuries. At our holiday camping site you'll find a market selling all kinds of fresh, local produce, with a butcher, greengrocer, fishmonger and delicatessen, so you can enjoy a meal at your mobile home. You can buy any clothes or sports equipment you need to enjoy your holiday, and catch up on your reading with papers and magazines from the newsagent, as well as picking up a few souvenirs to take home. Have a night out and a night in when you dine at the campsite. Enjoy a lunchtime or evening meal in our restaurant, or grab a takeaway and hit the beach. Pizza from a wood burning oven is always available, and our ice cream parlour is sure to be a hit with all members of the family. At the end of the day, watch the sun go down as you sit at the bar with a drink.